TS Solar Calyxo GmbH has again significantly increased the efficiency of its thin-film solar modules. The European market leader from Bitterfeld-Wolfen improved the output of its modules by around 20 percent from an average of 90 watts to 111 watts per module. The efficiency of the modules reads now 15.4 percent instead of 13 percent previously. Production has already started. Together with its parent company TS Group, Calyxo brought the new generation of modules to market maturity in just six months of development. The performance of the new modules has been independently confirmed by Coburg Univercity of Applied Sciences and Arts. 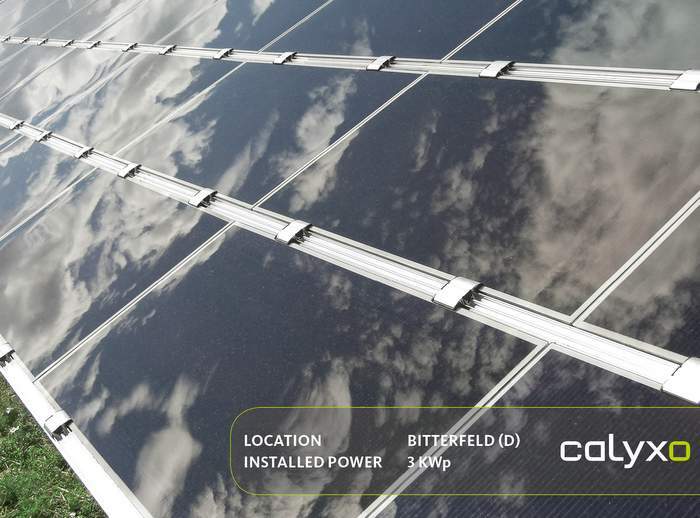 Calyxo is the world’s number two manufacturer of cadmium telluride (CdTe) thin-film solar modules. “This further increase brings us for the first time within range of the efficiency of polycrystalline modules, which have so far been ahead in terms of performance,” emphasized Stephan Koehne, CEO of the TS Group. Compared to thin-film solar modules, polycrystalline modules have the disadvantage that they are less robust and less performant in low light conditions. Köhne continued: “Our next goal is to close the gap to monocrystalline cells in the near future. These are currently even more efficient, but much more expensive.” With the help of patented process improvements and further investments, Calyxo intends to achieve an efficiency of 18 percent in the near future to become the market leader. Calyxo is among the few glass-glass module manufacturers in the market and based on this their modules are extremely robust and long-term stable. The conventional crystalline modules usually have a plastic film on the back instead of glass, which can make these modules less reliable, especially in climates with hot temperatures and high humidity. In addition to their longer service life, thin-film solar cells also cope better with shading and achieve higher yields in poor lighting conditions. In addition, the efficiency is less sensitive to high temperatures. In electricity generation, this can lead to an overall advantage of up to 20 percent per year compared to comparable crystalline solar modules.